I had about 600 mailboxes in my organization for migration. But the batch file migration facility helped me perform the task without any trouble. My senior is extremely happy after such a quick migration. Thank you Kernel software! 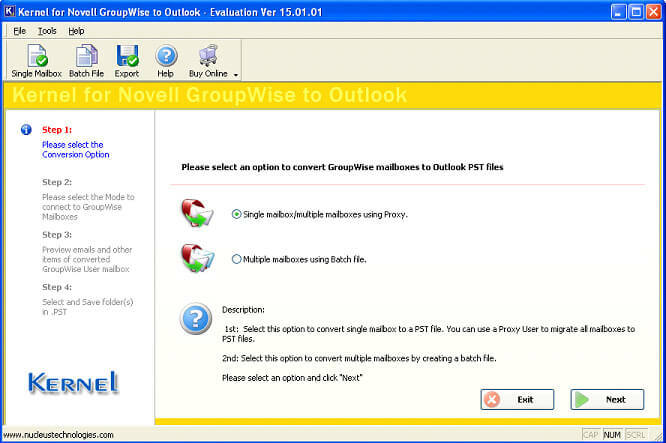 Kernel for Novell GroupWise to Outlook is a total tool for the migration of GroupWise mailboxes to Outlook. It converts GroupWise mailboxes to PST, without loss of any information. It moves mailbox items like emails, calendar, address book, attachments etc. accurately. The integrity of the data is maintained in the migration. It performs simultaneous migration of single or multiple mailboxes. Single user can use its Proxy Access feature to access all the mailboxes, and to move them to Outlook PST. Administrators can create NUCON or .XLS files for migrating a batch of GroupWise mailboxes. Multiple mailbox migrations ensures optimum use of time and effort for the migration process. Before saving to PST, mailbox items can be previewed. It enables users to be sure of the accuracy and completeness of recovered data before saving them. However, this facility is available only for single mailbox migration and for migration of multiple mailboxes using proxy access. Migration of archived items is very simple with this software. Users need not worry about the difference in the structure of archived items in GroupWise and Outlook. Simply by selecting the option for the archived item migration, they can migrate archived items along with the mailboxes. With Kernel for Novell GroupWise to Outlook, one can migrate items having Unicode characters too. After migration, they can be accessed in Outlook without any difficulty. Also, this software supports the migration of deleted items. It recovers the items from the Trash folder to move them to PST file. 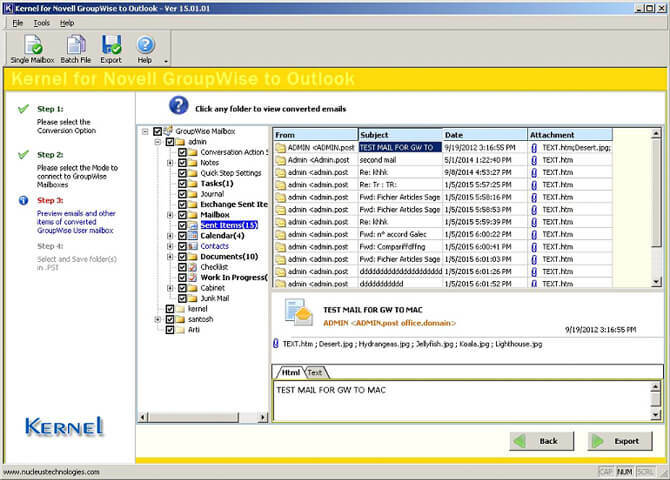 Kernel for Novell GroupWise to Outlook is an easy-to-use tool. You can download and install it without any difficulty after checking for the basic requirements. Migration process using this tool is very simple. On every step, you will get all the necessary instructions on its screen itself. 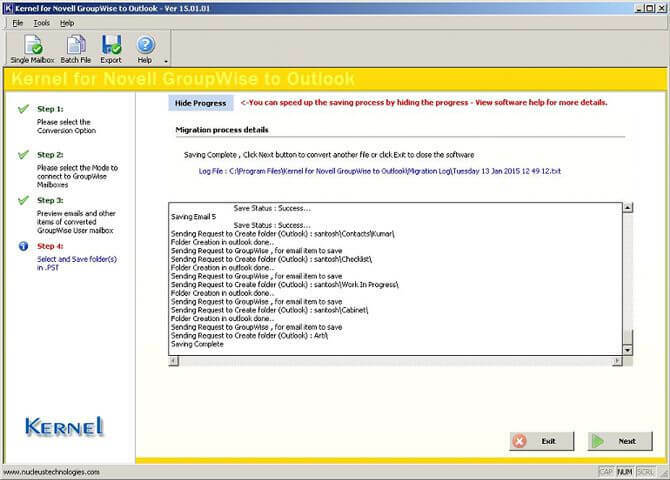 Kernel for Novell GroupWise to Outlook follows a simple procedure for migration. Here is how you can move a working user mailbox from GroupWise to Outlook in four simple steps – Select the conversion option, select the connecting mode, preview, and save. Step 1Select the conversion option For the migration of the default GroupWise mailbox, select Single mailbox/multiple mailboxes using Proxy option. Preview The software displays the mailbox folders and its content for preview. 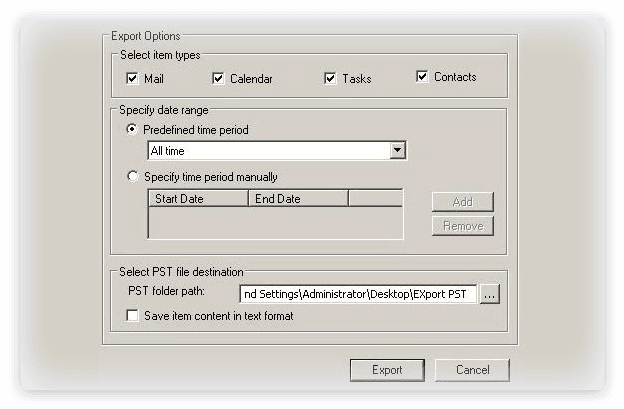 Save the mailbox in PST by providing required export options and PST location. How can I prepare for GroupWise to Outlook migration? GroupWise to Outlook migration is a complex process. So you are advised to perform a trial migration using the free version of Kernel for Novell GroupWise to Outlook. It will let you know about the feasibility of migration on your premises. 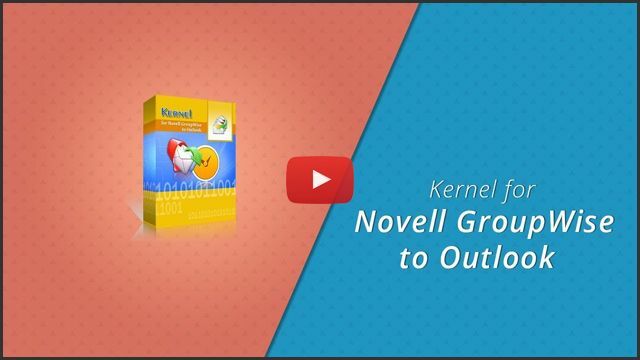 What are the main advantages of having Kernel for Novell GroupWise to Outlook migration tool? 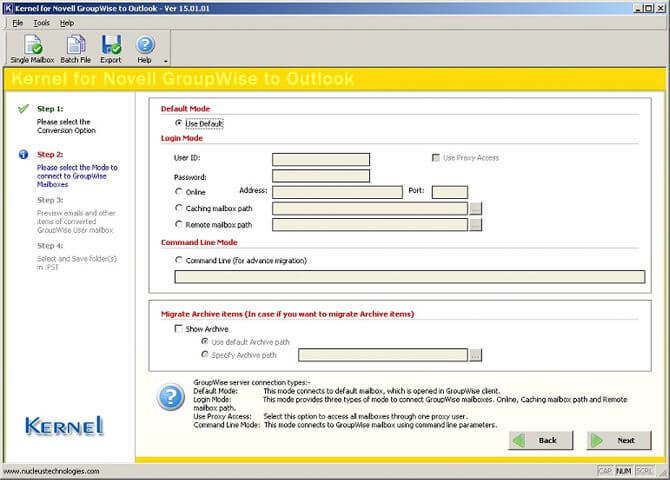 Kernel for Novell GroupWise to Outlook is a user-friendly tool that can be used with no training or technical expertise. 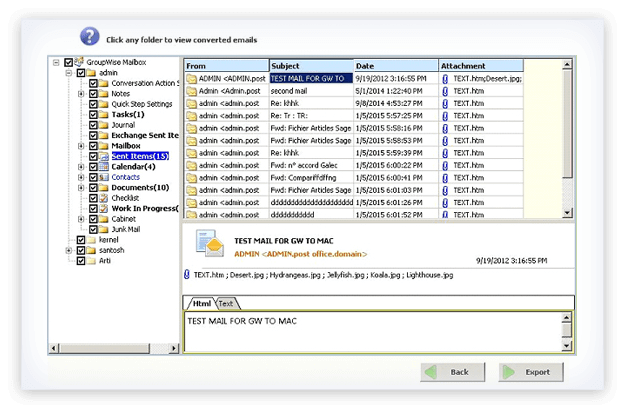 Administrators as well as normal users can perform multiple mailbox migration using this tool. So it is a convenient and cost-effective tool from the point of view of organizations. Do I need to buy the full version after using the trial version of Kernel for Novell GroupWise to Outlook? Purchasing the full version is not mandatory. But for saving more than 10 items from GroupWise folder, you need the licensed version of the tool. So it is highly recommended. However, you can take a decision on it considering your requirements. Converts multiple Novell GroupWise mailboxes to Office 365 accounts quickly. Migration process is so easy with the tool, and you can relax about the migration procedure as you will get a complete report after it.. The tool works instantly after starting it and does not require any prerequisite or change in settings. Grateful to my acquaintance who introduced this tool to me. Hats off to the smart designers and programmers for making this software an efficient one. Lepide Software proudly announces the release of Kernel for Novell GroupWise to Outlook version 15.01.01 software. The software version 15.01.01 has been upgraded with advanced Proxy Access feature that facilitates the migration of multiple GroupWise mailboxes with proxy access. In addition to that, the software can convert multiple GroupWise mailboxes to Outlook mailboxes using a batch file.